The Samsung BX series of monitors has been discontinued and can no longer be purchased. In fact, with the decreasing cost of LCD production, 24-inch displays have pretty much replaced the smaller 22-inch models. If you are looking for a new LCD computer display, be sure to check out the Best 24-inch LCD Monitors list. Samsung's BX2231 is one of many new LED backlit displays on the market. The 21.5-inch display does have the benefit of featuring anti-glare coatings and a very thin profile. Color accuracy was a bit off straight out of the box but then this consumer level display is not one that many graphics professionals would be looking at. Overall, the display is a nice consumer level display that balances price, size, and features for those looking at a relatively compact but full HD compatible monitor. Dec 17 2010 - Samsung's BX2231 display features a 21.5-inch display panel that offers a native resolution of 1920x1080 that allows full HD video support. This seems to be the normal resolution now for this size screen compared to the previous 1680x1050. Unlike many consumer displays that now use glossy coatings, Samsung still uses an anti-glare coating which helps reduce glare and reflections making it a much better choice for bright lighting conditions. The 21.5-inch LCD panel uses the very common TN panel technology. This allows for very fast response times and very affordable displays. The downside is that they generally are not known for they high color gamuts. In testing the screen, the uncalibrated screen was a bit too bright and the colors very saturated, especially the reds. The best color results were achieved by turning up the blue and green channels and then reducing the brightness to around 70-percent. 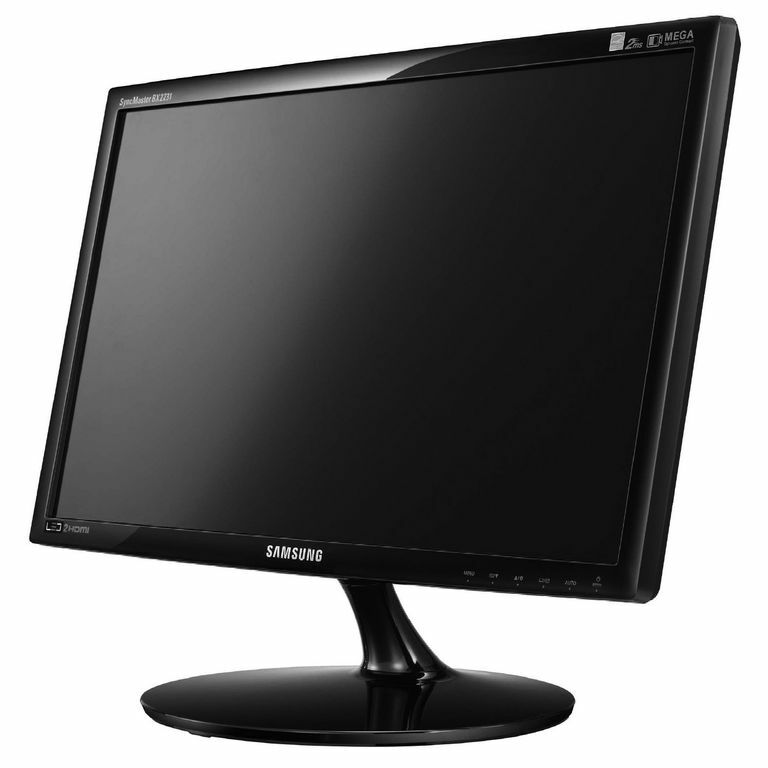 As with many new displays, the Samsung BX2231 uses the new white LED backlight technology. This has two distinct benefits over traditional CCFL lighting. First, the LED backlights use much less energy. Hooking the display up to a wattage meter showed that the panel used just 20 watts under 100 percent brightness and negligible wattage when in standby. The other benefit of the LED backlight is the reduced size. In fact, the display itself is extremely thin thanks to the power supply being moved outside of the panel. The Samsung BX2231 uses a fair amount of glossy black plastics on the exterior casing including the base stand. As with most low-cost displays, the stand only features a slight tilt adjustment. The bezel size is relatively small and not obtrusive at all. At the bottom of the panel is a set of touch-sensitive controls for adjusting the screen. The buttons are a tad small and not backlit making them difficult to use in certain conditions. The onscreen menus are fairly well laid out. For connectors, the BX2231 comes with two digital HDMI connectors and an analog VGA connector. If you happen to have a video card that uses DVI connectors, Samsung has included a DVI to HDMI video cable. Unfortunately, Samsung does not include an HDMI cable for those with laptops or desktops that have the native connector. If you do happen to use an HDMI video source that also carries audio, Samsung includes a mini-jack audio output connector to route audio to speakers.